Breakfast is the most important meal of the day, since it provides the energy to start our day. At the same time, most working families do not have enough time in the morning to prepare an elaborate breakfast, so something quick must do. Fortunately some foods are still very tasty, when prepared ahead of time, and kept fresh in the fridge, or even frozen for later use. Pancakes and waffles are some of these breakfast foods which I love preparing on weekends, and freezing the leftovers for busy mornings. Place the milk in a medium bowl, and mix in the vinegar. Let it rest for 15 minutes, to curdle the milk. In a large bowl combine all the dry ingredients, and set aside for now. Separate the egg yolks from the egg whites, and keep the egg whites in a small bowl in the fridge for now. Stir the milk and vinegar mixture, and mix in the melted butter and vanilla extract. Incorporate the wet ingredients with the dry ingredients, but do not mix too much. Remove the egg whites from the fridge and beat to form stiff peaks. Gently fold in the beaten egg whites into the pancake batter, and let it rest for 3 minutes. Place 1/4 cup of batter for each pancake, onto the hot pan, and cook until the edges are getting golden, and small bubbles are forming and popping throughout the pancake top. Flip over, and cook for 1-2 minutes longer, until set and golden on both sides. 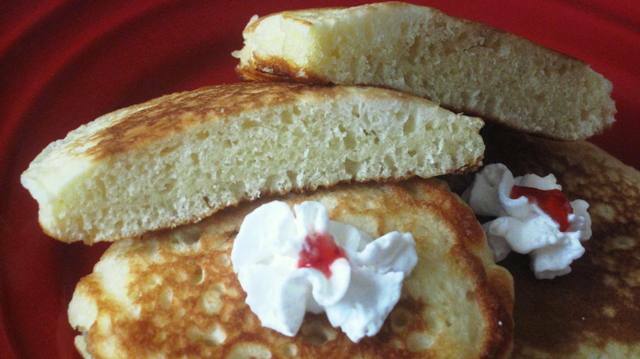 If your pancakes are getting too dark too soon, adjust your heat by lowering it a bit. Serve with your favorite flavored butter, syrup, jam, fresh fruits, whipped cream, or anything you like.